Welcome to Cremation! 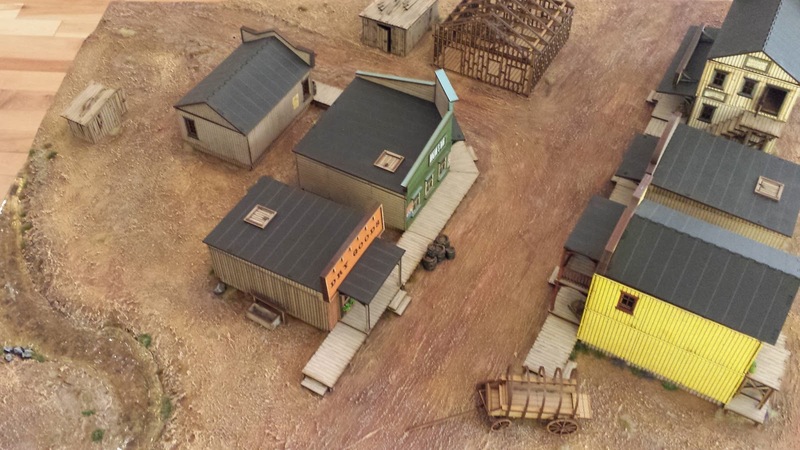 It's a frontier town that I constructed for Dead Man's Hand, the 28mm skirmish game by Great Escape Games. 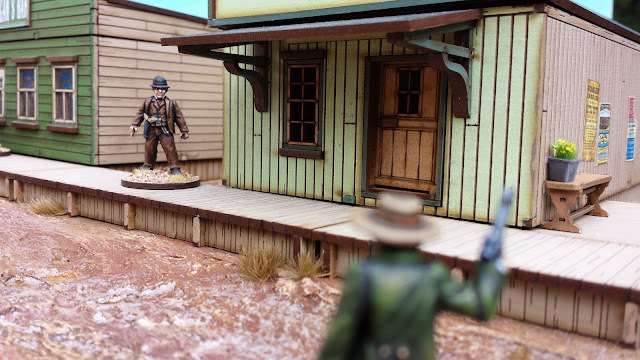 I love this game... it's fast, has lots of old-west flavour, and boasts a dedicated range of excellent miniatures (by Great Escape) and terrain (by 4Ground). Cremation is my first attempt to create my own battle-board -- a custom built battlefield with integrated scenery and buildings. I was inspired by the step-by-step how-to video on Great Escape's website. It was the most satisfying modeling experience I've ever enjoyed. I suppose part of the pleasure comes from the fact that a battle-board is so BIG. But it's also wonderful to lose yourself in a space that can accommodate so much detail. I guess this is a joy that model train enthusiasts know well. And urban planners. I became pretty obsessed with Cremation while I was building it. This is part of the pain/pleasure of working with 4Ground buildings. Constructing them is easier than painting a miniature, but leaves one with a true sense of accomplishment because they're so good looking when they're done. But more than that, there are so many possible accessories, that it is easy to go overboard. Soon I didn't just want buildings... I wanted furniture. And boardwalks. And shelving. And pictures. And posters. And flower pots. For instance, I blew about $60 on eBay on various out-of-print Letraset transfers just to do a couple of the store signs (such as "Bledge's Bank and Deposit"). As a result of all this madness, I like the pictures of Cremation without any actual miniatures better than the pictures with them. Cremation also was the first time that I employed weathering powders in any serious way. I wanted to use these pigments in order to create a variegated but blended pattern of dust and clay for the streets of the town. And frankly it was a joy to see how quickly and easily the powders can achieve life-like results. I imagine Cremation as a watering hole in the south-east of the Arizona Territory: east of Yuma, west of Flagstone, south of Red Rock and north of Ague Verde. It's just a pimple on a map of wastelands -- it's main attraction being the fresh water of "Pineapple Creek" (so named because I melted the plastic beads for the river in a used can of pineapple juice). But despite its small size and barren environs, Cremation attracts a colourful crowd: Apache raiders, Confederate deserters, bad banditos, bank-robbers and rustlers. 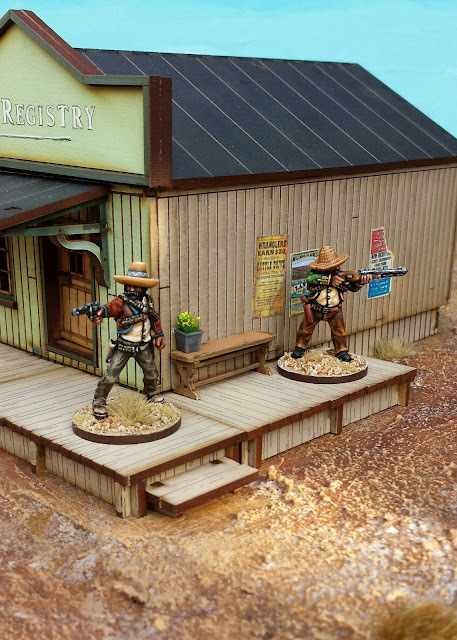 And lawmen. Lots and lots of lawmen. Why, here's a lawman now. 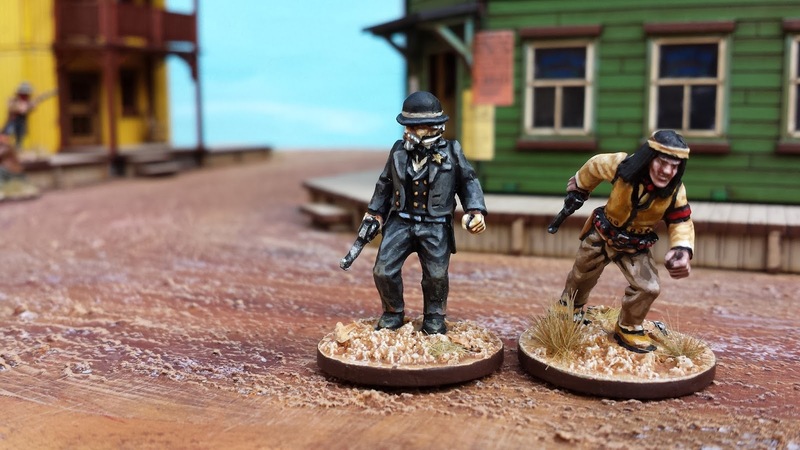 In the picture below, we meet Sheriff Dexter MacGrudy, accompanied by the famed Comanche scout, Isaiah Youngblood. If they can't bring order to the streets of Cremation, no one can. Ole MacGrudy may look like he's seen better days, but he's still meaner than a coot and faster than a hungry rattler. Yes, you have to get up pretty early in the morning to get the jump on Dexter MacGrudy. Here we see someone who has gotten up pretty early in the morning. Even earlier than Sheriff MacGrudy. Simply going for a pee is dangerous in Cremation. Too bad. Time to get another lawman! Thanks for looking! Stay tuned for more pictures of Cremation next week. Waiting for more! 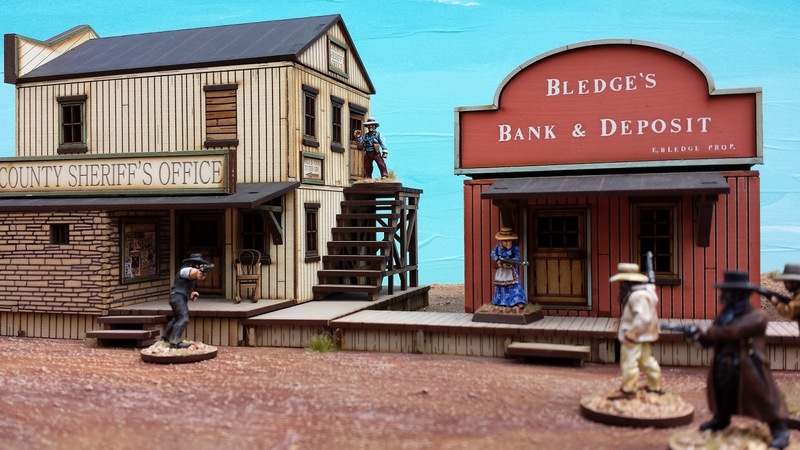 Great buildings and miniatures! Thank you Michal! I'll be posting more soon. Interesting I have a similiar project going on. ;) Very nice. Have you posted pics yet? I'd love to see what you've got. Im about to on the Oldhammer page. Are you on there? I will do a proper blog post probably on this in two weeks. I should have everything done then. I've got a town going too! Must be something in the air! I'm using Fistful of Lead for rules. Ever try them? I've never tried Fistful of Lead - is it good? I see from your profile that you're in NY - is that right? And I checked out your blog. I can't believe I've missed it before; you've got some great stuff on it. I love your McDeath project! You bet I'm going to Hot Lead. It is a lot of fun -- it would be great to meet up with you there. I'll try to message your through Google Plus with my contact info (something that I've never tried before, so bear with me). Wow! That is just brilliant! Great job! Thanks everyone! I'm happy that you're enjoying Cremation. I'm looking forward to posting more soon. An innovative tactic by MacGrudy. A sheriff in the outhouse would be able to monitor the bad guys' movements. Thanks James! One of these days/years, I'm going to build up the courage to prepare a game for Hot Lead. In fact, I was inspired to do this town partly by a great Hot Lead game that some guys from Windsor put on a few years ago. Amazing pictures, a truly impressive town! Quite impressive, particularly the groundwork. Looks seriously dusty. Aside from "use pigments" any advice for that? So, in broad strokes, the video that I linked to in the second paragraph has most of the steps that I followed. But in brief: I textured the surface of the foam board by applying acrylic textured medium (a mix of "coarse" and "extra-coarse"). Then I basecoated it with mix of dark/brown and terracotta red. I highlighted this with a stiff brush, using increasingly sparse and increasingly light layers of paint. Then I spread out pigments (umber, burnt sienna, and raw sienna) and mixed them about with white spirit. Then lots of varnish -- and Bob's your uncle. I have these rules. So, this is what can do with them...another game I have missed. Well I hope you give it a go. I just played a game the other night and it was fast and fun. Everything looks top notch Sully, really great work. This would make for an epic Boot Hill game. 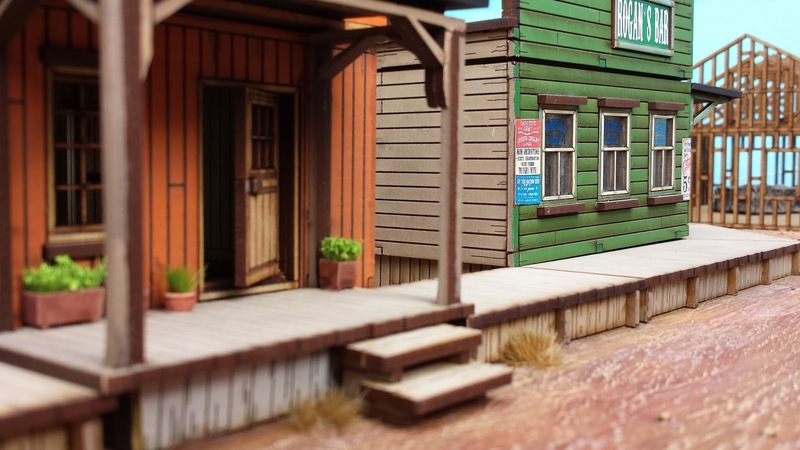 Do you have the rules for Boot Hill? Hi love the town, and like others here I'm building my own. I am doing as close as I can a Deadwood from the series. 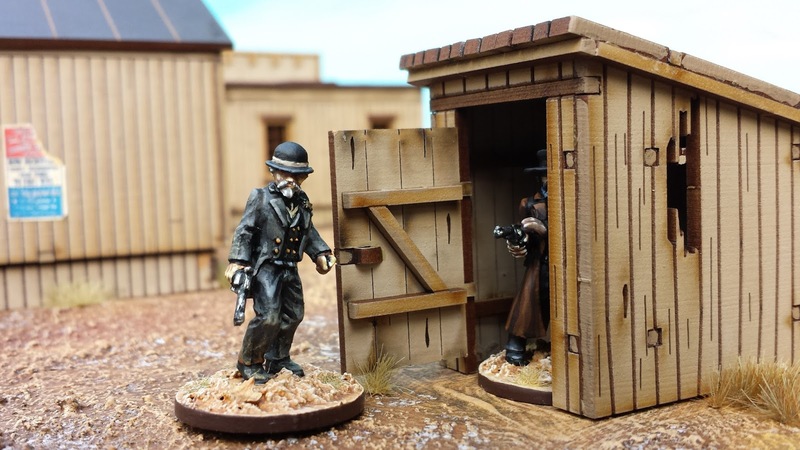 I have just finished the Gem bar/brothel which is from the sarissa precision range check them out for there old West range. 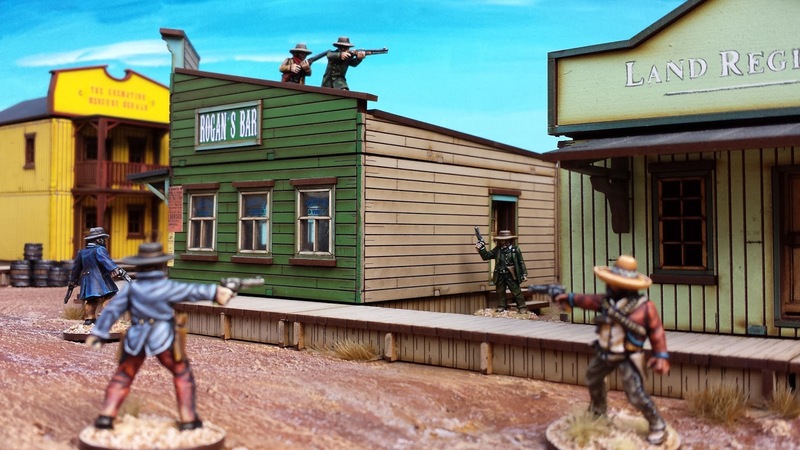 They have just made a wild west locomotive train set which I saw at Salute which is amazing all the best with Cremation love it.